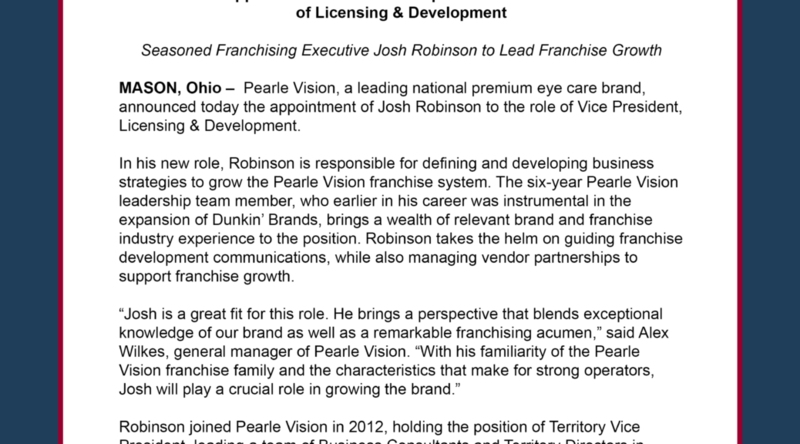 MASON, Ohio – Pearle Vision, a leading national premium eye care brand, announced today the appointment of Josh Robinson to the role of Vice President, Licensing & Development. In his new role, Robinson is responsible for defining and developing business strategies to grow the Pearle Vision franchise system. The six-year Pearle Vision leadership team member, who earlier in his career was instrumental in the expansion of Dunkin’ Brands, brings a wealth of relevant brand and franchise industry experience to the position. Robinson takes the helm on guiding franchise development communications, while also managing vendor partnerships to support franchise growth. Robinson joined Pearle Vision in 2012, holding the position of Territory Vice President, leading a team of Business Consultants and Territory Directors in driving business results and sales plans within both corporate and franchise locations across North America. Before joining Pearle Vision, Robinson held a variety of leadership positions throughout his 30-year career, including with the aforementioned Dunkin’ Brands, Pepsi Cola, Getty Petroleum, and Burger King. During his nearly two decades with Dunkin Brands, Robinson guided the development and growth for the Dunkin’ Donuts and Baskin Robbins brands. Named to the new position at an exciting time for the brand, Robinson takes on the licensing and development role as Pearle Vision holds the prestigious honor of being named the #1 franchise in the Health Products category of Entrepreneur magazine’s “2018 Franchise 500” list, considered the world’s first, best and most comprehensive franchise ranking. Additionally, Pearle Vision ranks #72 overall among all franchises in the ranking, placing the brand in the top 20 percent of U.S. franchise concepts. Pearle Vision is positioning its current and projected franchise opportunities with: 1) skilled optometrists – both seasoned and recent graduates; 2) opticians (employ optometrists or lease space to them); and 3) investor groups. Ideal franchisees have a desire to build strong teams, embrace innovation, remain customer and care focused and dedicate themselves and their businesses to the communities they serve in an industry with sustainable demand. Pearle Vision was founded in 1961 by Dr. Stanley Pearle, who began the concept of one-stop, total eye care with the opening of the Pearle Vision Center in Savannah, Ga. Dr. Pearle combined complete eye exams with an extensive selection of eyewear. In 1981, Pearle Vision began offering franchise opportunities to select doctors and opticians. Today, with approximately 550 EyeCare Centers located throughout the United States, Canada and Puerto Rico, Pearle Vision is built around a doctor-centered business model with a primary focus to deliver genuine eye care to patients and become the neighborhood trusted source for all their eye care and eye wear needs. Pearle Vision is owned by Luxottica, a leader in premium fashion, luxury and sports eyewear. To learn more about the Pearle Vision franchise opportunity, visit http://www.ownapearlevision.com or call 1-800-PEARLE-1.